It is the time of year people are busy traveling or having company over around a fire to warm up from the brisk night air. While many people are enjoying these fun activities, we all know that old man winter is right around the corner here in Dallas, Texas. It is important to take time to check that certain areas of your home are protected from the cold. Areas that are sometimes forgotten are the inside and outside faucets. Frozen pipes can not only cause many problems to the homeowner, but can be extremely costly. Homes that are built in colder religions tend to have pipes that are insulated but those who are located in warmer regions, most of the time, are not. This can lead to problems if there is a sudden cold snap. 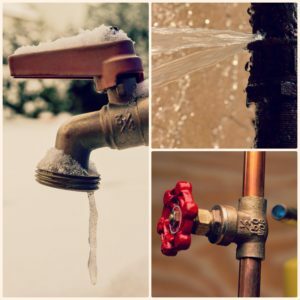 Here are some easy steps to take to make sure your faucets are ready for the winter cold. First, you want to make sure you locate all of the exterior faucets on the property. Some may be located on/in a wall, in a box in the ground, or on a pipe coming up out of the ground. All hoses should be disconnected, drained completely of water, and stored away. Next, shut off any accessible valves to the outside pipes and faucets. Open the handle on the faucet to ensure all water has drained out of the pipe and faucet itself. After the pipe drains, turn the handle on the faucet to the off position. Last, wrap all exterior faucets with a towel or cover them with a wall hugging insulating dome. Any interior faucets that are located inside on an exterior wall should be left on to drip at a very slow pace and the cabinet doors should be left open to allow warm air circulation. To further protect the interior pipes, it is advised to wrap the pipes in an insulation sleeve. These inexpensive sleeves can be found at your local home improvement store and can be used year-to-year. So as you are enjoying your fun winter activities, make sure you set some time aside to winterize your faucets first. These simple steps can save you from having to clean up a mess in your house and a costly fix.